← TMME, No 1/2 2009 is here! Blog tips: "Wild about math!" Sol Lederman has a very nice blog about mathematics, and the focus is on “making math fun and accessible”. 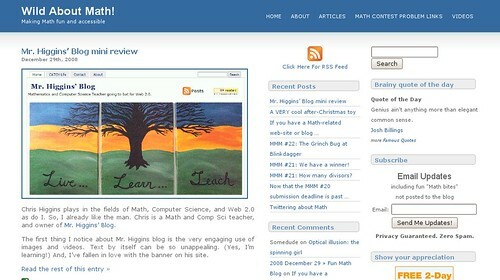 The blog itself is called “Wild About Math!“, and it is definitely worth checking out! Sol has written much about learning mathematics by doing mathematics, and he appears to have a special interest in solving mathematical problems. One of the things Sol often writes about is the so called Monday Math Madness problem from the Blinkdagger blog. Lots of people already subscribe to the blog, and you can too! It’s easy!